I have had the opportunity to make the acquaintance of Md Tokon in my studio class at the Art Students League of New York for several years. He has become an integral part of the creative functioning of the class. He works hard on his paintings and he also as my class monitor works hard in helping his fellow students. It has been a privilege to observe his evolution as a painter; over the course of several years. I have written in the past that his work was accomplished, well made, and expressive of his personal experience and of his sense of color and nature. Of late his work has become all the more succinct, direct, and to the point as he has matured into a painter who has a clear idea of what he needs to paint about. It is no small accomplishment to travel from one culture to another and to absorb what is universal and important from both cultures; and be able to reflect those insights and to create works of art that resonate meaning to all. Md Tokon has evolved into a very fine emerging young artist who has grasped the essence of the East and the West in his work. His paintings are direct; they do not hesitate. The paintings deliver their message reflecting nature, emotion, and passion; with intense aesthetic expression, through surface and color. 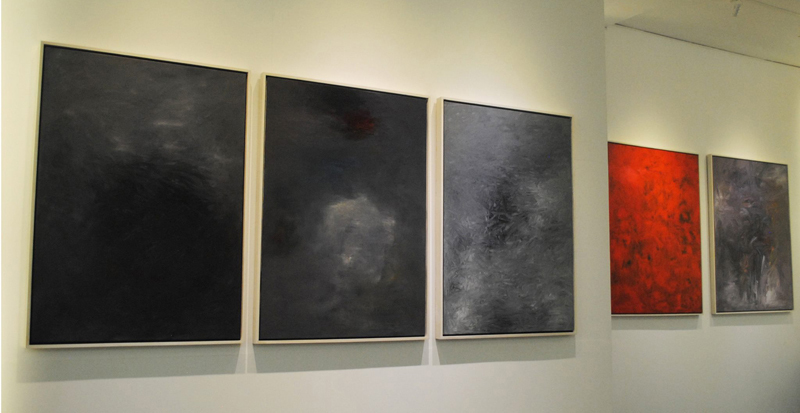 With each passing year Md Tokon’s work gets better and more precise, exhibiting his increasing sophistication and understanding of contemporary abstraction. When an artist is truly in touch with himself; he can begin to touch others through his work. With each passing year as life changes with the passage of time; an artist's work evolves and reflects those changes. It has become clear with the passage of time how Tokon's work reflects life's changes; and strike eternal chords; and how powerfully they connect to the viewer. A prolific painter, Md Tokon started to paint when he was very young in his native Bangladesh and continues to produce remarkable paintings in New York City. One can easily detect a mature and skillful painter by the way he/she navigates space and handles the medium. The physicality and immediacy of his paintings are inspired moments of deep reflection; they transport the viewer to a place neither here nor there, a timeless place beyond the horizon. Cool and blazing colors, drips and gestures, lush and heavy-handed surfaces are tonal polarities that evoke contradiction and harmony in a transformative process that denotes human aspiration and dreams, struggle and celebration, a push and pull effect that propels layers of translucent colors to slide into opaque textures. Md Tokon’s effects of light are surely romantic quests that attest to the dualistic nature of art in uncovering universal truths. While his earlier works might appropriately remind one of the Luminists or the fin de siecle Impressionists, his recent canvases are darker and more expressionistic in tone as characterized by the loose brushstrokes, bold and pared down colors, devoid of conundrums. In his 2014 solo exhibition at Leonard Tourne Gallery, New York, he presented large and small scale canvases in striking contrasts. Deep reds turning to undefined hues with slivers of blues, green and gray, those were the operative palette colors. There was an evocative atmosphere with prescient sounds of solitude and a bit of nostalgic sense of longing and pining. Perhaps from a different angle the paintings would suggest to some viewers, consciously or subconsciously, pressing issues in the environment today such as climate change, while reminding us of the time when nature was pristine and sublime. Every artist takes a cue from previous generations in pursuit of identity and a place in the sun either through embrace or negation of the visual art tradition. In Md Tokon’s art, it’s the former. There are intriguing affinities, kinship and frames of reference to art historical past that come to mind: the Hudson River School landscapes in the late 1800s; the J.M.W. Turner’s paintings and watercolor exhibition at the Metropolitan Museum of Art in 2008; and, Philip Guston of the New York School for all intensive purposes because they reveal something in common — resonant gestures and luminescent colors that go beyond the surface. In a globalized art world with looming homogeneity and unabashed consumerism, it is imperative for artists to maintain integrity despite practical challenges by focusing on what matters most: its redeeming quality. Only time will tell, but it’s safe to say that Md Tokon is on a voyage to this Herculean task. To witness his painting is to walk into a mindscape full of memories and experiences. Md Tokon's paintings are pure abstractions: no recognizable, figurative element come to the rescue of the viewer to help him "understand" what he has been given to see. His style, which has been variously linked to great artistic currents of the past such as Romanticism, Impressionism or Abstract Expressionism, makes great emphasis of color. The painter proceeds by layers. He adds up tonalities on the canvas and each new coat brings a new dimension to the overall result, rendering it more complex or, depending on the viewer's perspective, simpler. His images cannot be grasped at a glance; they require an active engagement. Consenting to that effort is a highly rewarding experience, for Tokon's painting aims at Beauty – which perhaps explains why critiques sometimes use the term "spiritual" to describe it. Md Tokon's lives and works in the United States, where he has attended the prestigious Art Students League of New York – an institution which counts the likes of Mark Rothko and Cy Twombly in its alumni. His work has also deep roots in Bangladesh. To the artist's own admission, the palette he uses is often a tribute to the incredible tonalities of the motherland. We could add that the poesy of his compositions hints at the long tradition of abstract painting in the country, and specifically at the work of the late Mohammad Kibria. "Light, Dark, Space" offers a dialogue between East and West, between the Modern and the Contemporary. It is an honor for Bengal Art Lounge to propose this highly meaningful exhibition to the public. His most noted artistic influences are abstract expressionist New York. Most of these painters favored large canvasses, dramatic colors, and loose brushwork. Their work inspired and inclined him towards his choice of style. He likes the action, freedom, power, strength, excitement, and most of all the emotion that color and line can communicate.